The i30's new front-end design will appear across the brand's range. It has a reworked hexagonal grille with a concave element, which Hyundai calls a “cascading” grille. The Hyundai i30's success has been important in boosting the brand's European growth in the past 10 years, helping it to achieve record sales of 505,400 last year. To improve the hatchback's competitiveness in the compact segment, Hyundai has added so many extras that it claims the compact has the best range of active safety technology in its class. The i30 also gets a design upgrade, introducing Hyundai’s new "cascading" grille to the lineup. Hyundai says the feature adds sophistication to the car's styling, which is important because design is the No. 1 reason among European buyers for choosing a car, said the brand's European design chief, Thomas Buerkle. 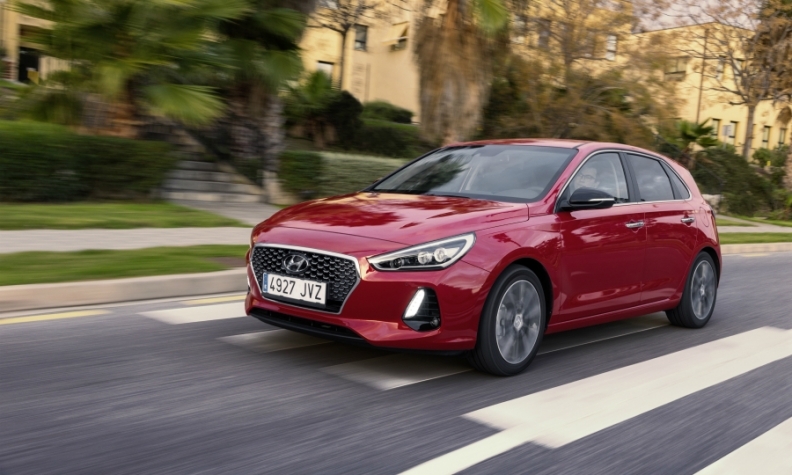 The third-generation i30 will play an important part in the brand's ambition to become the top-selling Asian marque in Europe, said Hyundai Europe marketing chief Jochen Sengiehl. "The i30 is the backbone of our lineup," he said. To boost i30 sales, Hyundai is expanding the family to four variants comprising a five-door hatchback, station wagon, four-door fastback and high-performance N-badged model with a 2.0-liter turbocharged engine that Hyundai will aim at the Volkswagen Golf GTI. The coupe-styled fastback will replace the slow-selling i30 three-door. The new i30 is based on the same platform as the Ioniq range of full-electric, plug-in hybrid and hybrid cars. Executives wouldn't comment on whether the i30's engine range will be expanded to include a hybrid version. The car is 40mm longer and 95mm wider than its predecessor but 10mm shorter. The wheelbase remains the same. The changes give the car a wide, solid stance and more room inside. Connectivity: The optional 8-inch "floating" touchscreen can be connected to Apple CarPlay and Android Auto. Engines: The i30 is the first Hyundai or Kia model to offer the group's new turbocharged 1.4-liter four-cylinder gasoline engine. Safety equipment: The optional advanced smart cruise control uses front radar sensors and can accelerate, brake or stop the car. Standard equipment includes driver attention alert, autonomous emergency braking, lane-keeping assistance and speed limit information. Driving dynamics: Doubling the amount of high-strength steel used on the body-in-white to 53 percent has improved the car's rigidity and made it more agile on the road.